QUALIFICATIONS: Students should know basic climbing skills such as belaying, rappelling and tie-in knots or must had participated in Basic or Advance Mountaineering Courses conducted by Nepal Mountaineering Instructors Association- NMIA or Nepal Mountaineering Association- NMA or equivalent. 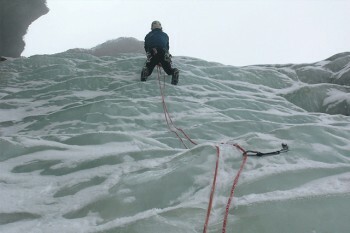 The training is designed for people with little or no experience on technical waterfall ice climbing. This course is an excellent option for people who aspire to improve their technical climbing skills for steeper snow or ice route with multi peaks above 6000 masl. Although conducting this kind of course is quite expensive financially, even so there is high demand of this kind of training in tourism industry. According to the previous incidents records, we definitely need to set up the qualified National responsible professional climbers as soon as possible with affiliation of related Government and non-government organization.